In continuous and inline thermoforming, the sheet is continually fed to the machine off a roll of plastic sheet. The continuous stream of plastic is indexed into a former, then trimmed and either discharged or stacked. The part that is trimmed away from the product is called a skeleton and it can be automatically fed into a granulator to be reused in the process. This is an automated process and can produce large quantities of product. 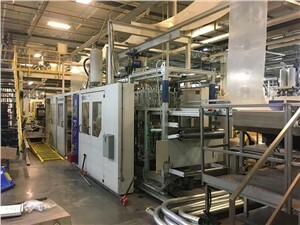 Typical items produced in a continuous or inline thermoformer are cups, plates, restaurant carry out clamshell containers.